Dickydoodah | Rebecca Dickson – Rebecca. Twenty something. Writer. Lover of London. 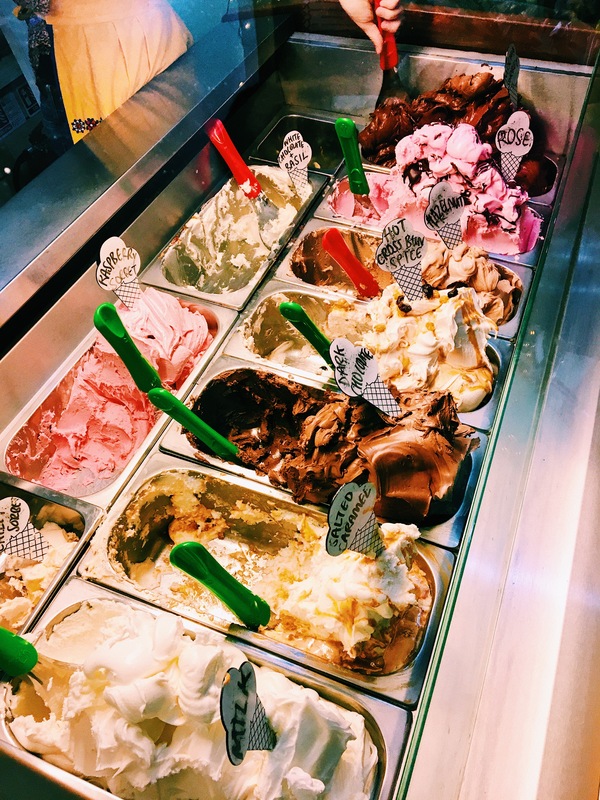 Following my travels, my thoughts, food I have tried and everything in between. I live in an interesting area. East London is filled with gentrification but there is such a mix of cultures and walks of life. Spar is a supermarket you imagine to be full or bargains and cheap things. 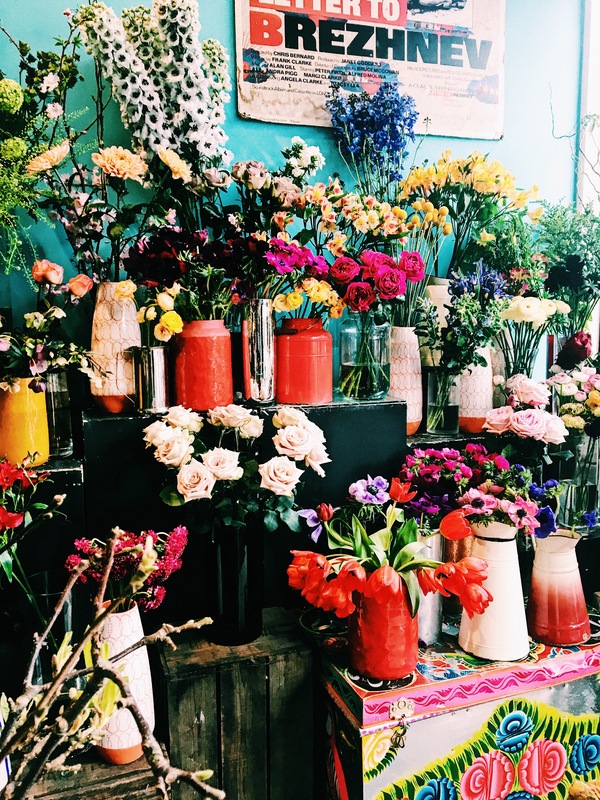 Spar in Homerton is the opposite – it is a trendy East London paradise. It is filled with lots of treasures and has lots going on. It was described by a friend of mine as a bit like Whole Foods and I can see why. The produce has mixtures of Spar products and other local businesses. 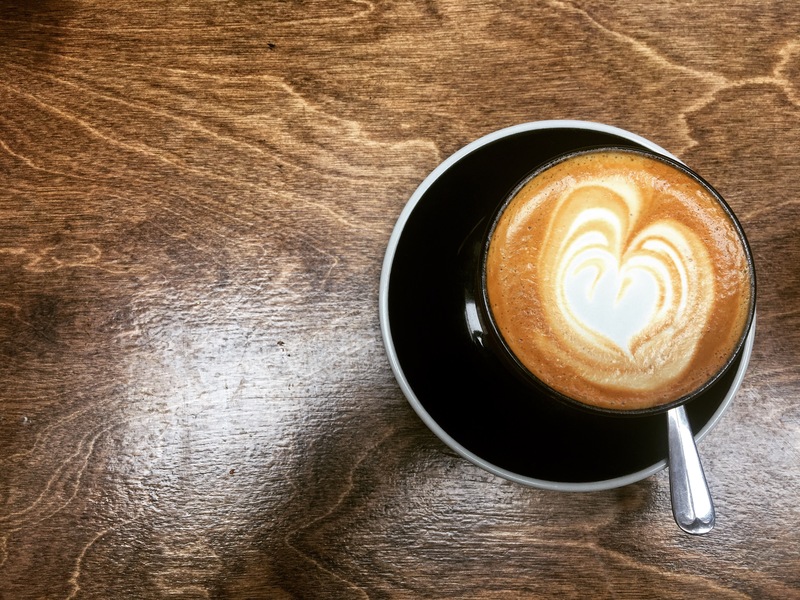 You will find coffee, peanut butter and other things all made in East London! Eat 17, based in both Homerton and Walthamstow originally had a restaurant above their supermarkets. They created Bacon Jam and sell a few different types in store. It’s always pretty popular. Fancy some coffee? You can grab some to go. Need a quick dinner? There is lots on offer. 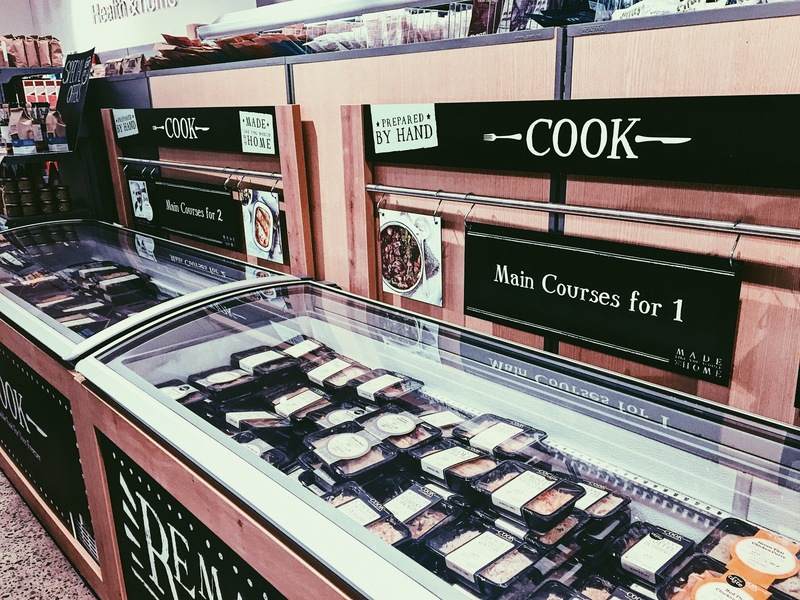 Spar Eat 17 have their own ready meals that are a little fancier. They also sell Cook which is the company that pre-makes meals and all you need to do is warm them up. 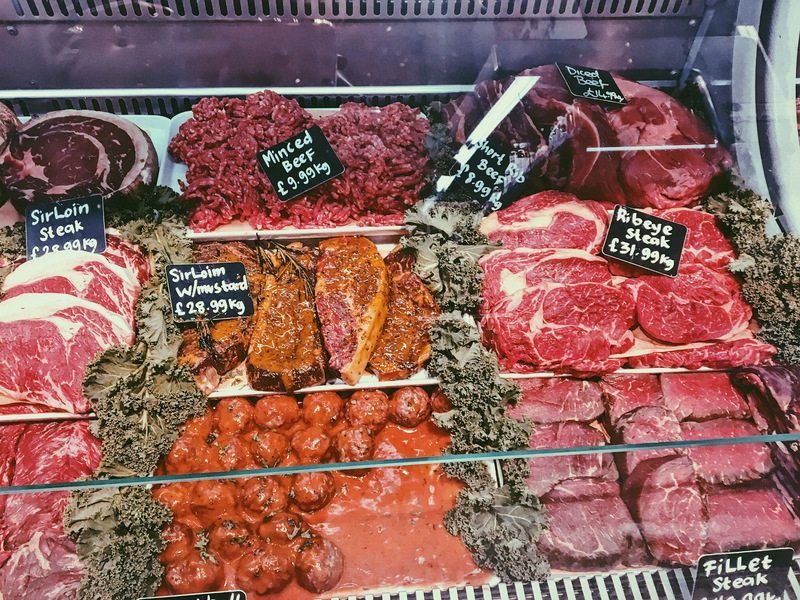 The butchers on the left hand side has a extensive range of meats to choose from. It might be a little more expensive than what you would get in a supermarket but the difference in quality is obvious. Chicken breasts can be shared for two people due to their size so they go further. If you fancy a quick hot meal then you can order burgers at the til and eat them there. There is even the option of a rotisserie chicken to take home! 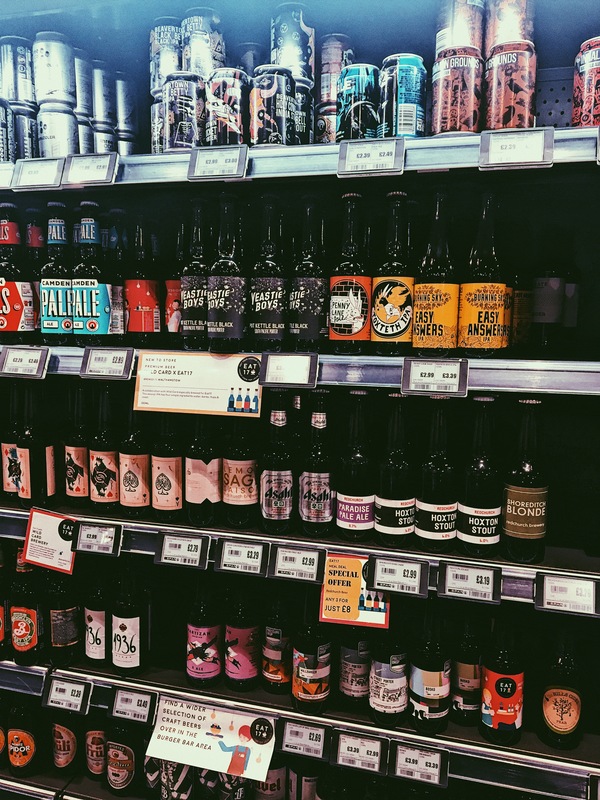 Beer selection is a mixture from across the UK wth lots from London. You can even grab a beer to wash your burger down! Think all of this was enough? 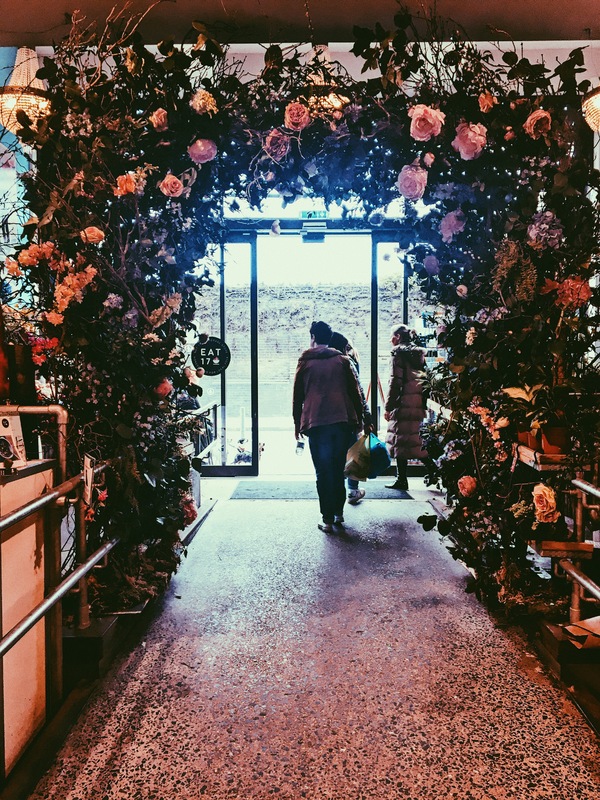 Well Rebel Rebel florists greet you as soon as you walk in, making the whole place seem so vibrant! If you wander upstairs you will find the Castle Cinema, which has recently opened it’s doors after a crowd funded campign to re open the cinema as it was one a long time ago. Jim’s Cafe on Chatsworth Road is always busy, whatever day of the week. I have been a few times and have had great experiences every single time. The decor of the place is great. It has elements of a traditional greasy spoon. These features have been spruced up and given a modern edge. The front of the cafe is all wooden booths and diner tables. When you get to the back room it has exposed brick, chipped tiles and a feeling of being really open and bright, a little like being in a conservatory. This time around, myself and a friend sat in the back room (a table away from Pixie Geldof, I don’t think I could have felt any more East London. We ordered latte’s and caught up. Then it came to the main event. I have tried a few bits at Jim’s but what I ate was definitely my favourite. 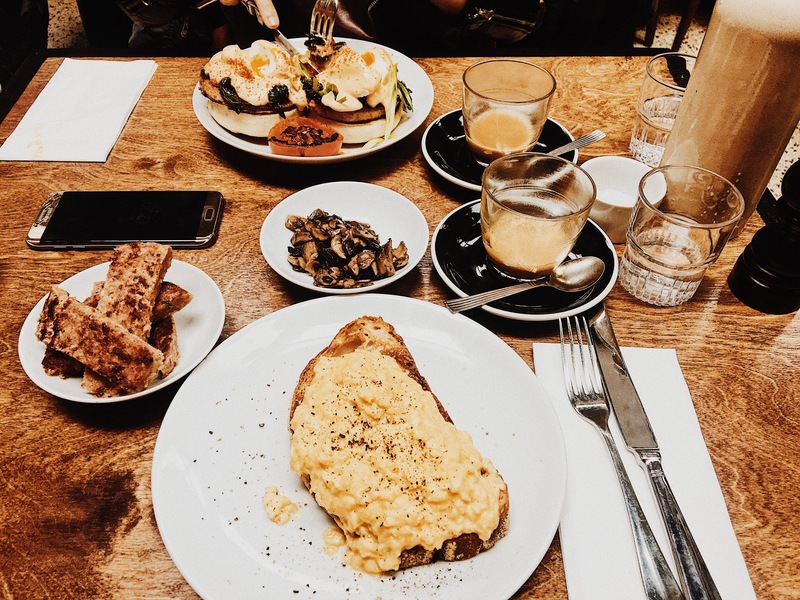 I had the scrambled egg with Gruyère and parmesan and mushrooms (which I had on the side)on sourdough toast. I had a side of sausage patty, which I couldn’t finish but it tasted AMAZING. The whole dish put a fancier spin on a traditional breakfast. My friend had the sausage and tomato Benedict which was huge! We both didn’t quite finish our meals but both really enjoyed it. It is refreshing to see items on a brunch menu that are a little different to the norm. Despite the fact hat it was busy, we didn’t feel rushed so managed to catch up and not feel too guilty. 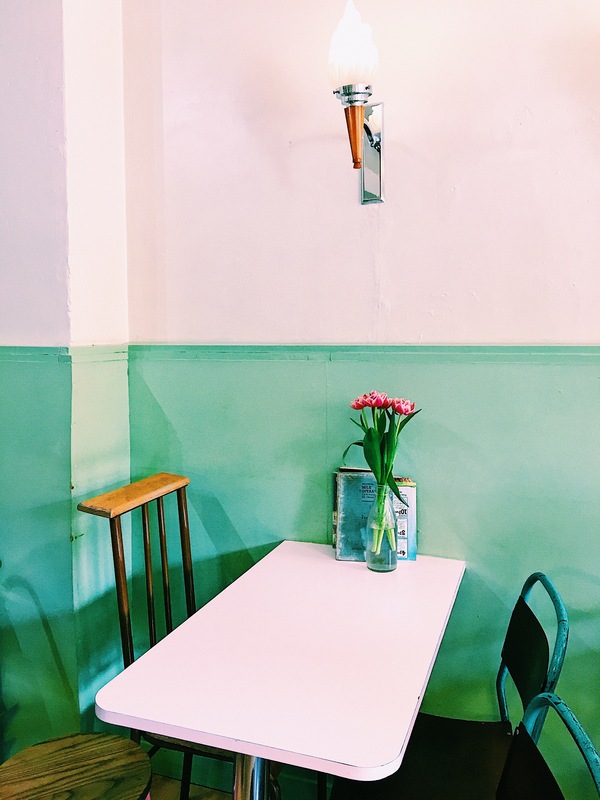 Jim’s is always the first place I recommend to people when they want brunch in East London. If you like little details, the pictures in the bathroom were from the original cafe itself! 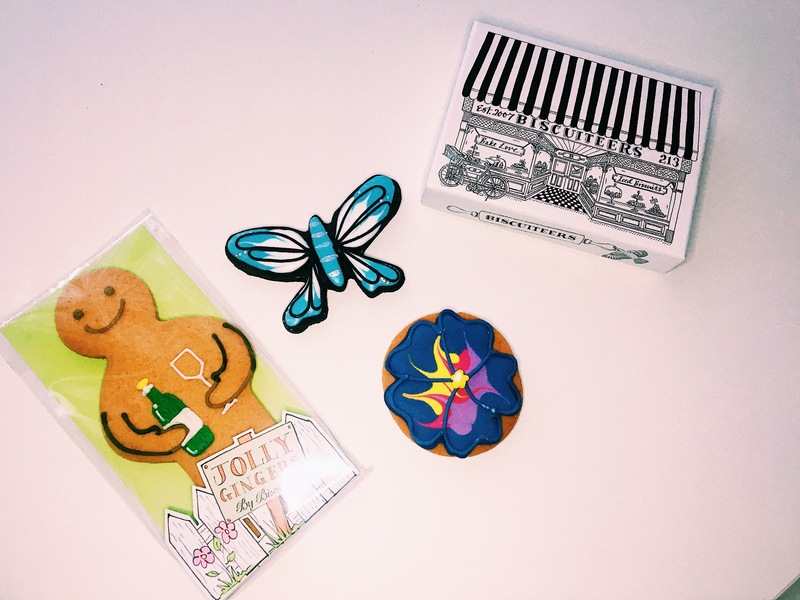 If you follow bloggers on Instagram, you will have probably seen the perfectly iced biscuits form Biscuiteers sent as gifts or attached to press packs. I found them purely by accident online and have been a little obsessed ever since. I ordered my dad a Batman themed box of iced biscuits for Father’s Day and booked an afternoon tea in the cafe as a joint Mothers Day and birthday present for my mum. We headed to the Portobello road to have a wander before getting to the cafe itself. 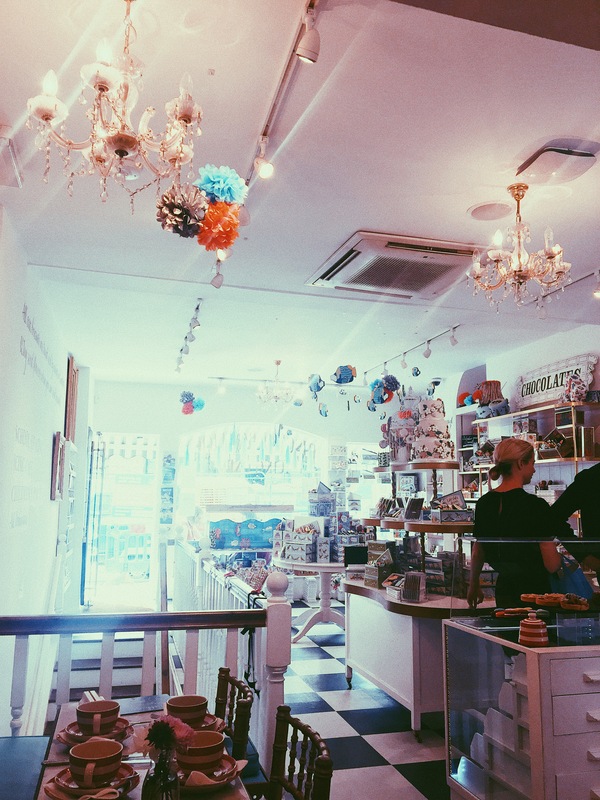 The whole place is bright and colourful with pom-poms attached everywhere as well as every kind of biscuit you could imagine. It had a really cosy feel to it as places to sit were on the side of the counter and outside. We sat down at our table with red and white crockery and were given a pot of English Breakfast tea. We then had a cake stand put down on the table filled with treats. On the sandwich tier there was cucumber and cream cheese, cheese and chutney as well as smoked salmon. 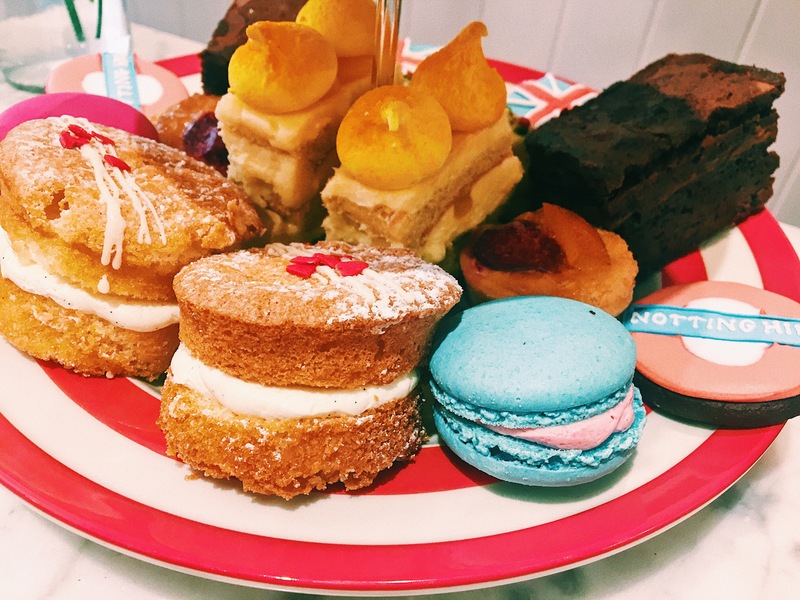 It then had the tier with salted caramel brownies, macaroons, white chocolate and passionfruit cakes, fruit tarts, Victoria sponges and iced biscuits. There was so much colour and flavour on the plate! We tucked in and the scones turned up! Everything was delicious without being overly sweet. There was so much food, I left a fair amount which was put into two “doggy bags” for us to take home. 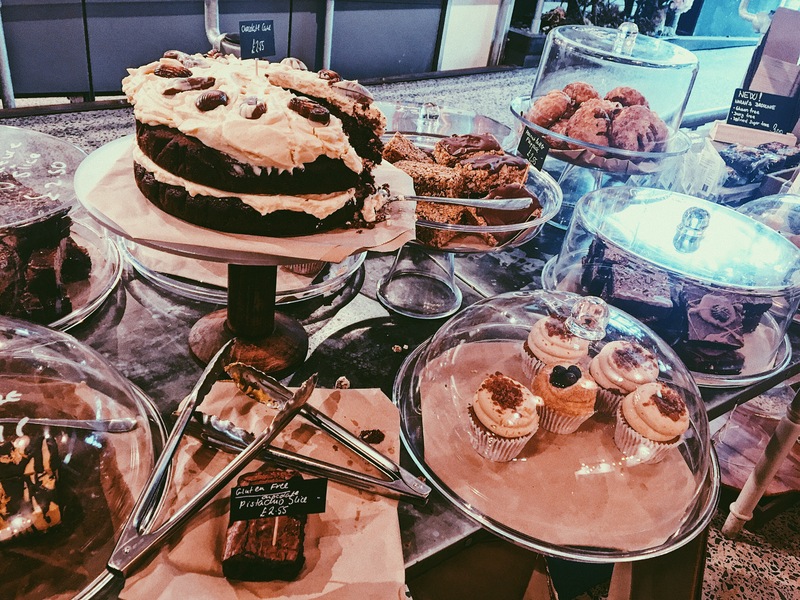 The Victoria sponge and the salted caramel brownie were absolutely incredible (SO good). Once we finished tea, we went to look at the biscuits so we could take some home. I picked a selection so I got a gingerbread, chocolate and vanilla. I spent ages trying to find the perfect ones. I am definitely going to get gifts for different occasions! It’s nice to see so much effort and time to be put into something – especially when it is going to taste great! When you think of Avon, you might think of the catalogues sent from door to door, with parties in your living room filled with your mums friends. There is actually a lot more to Avon. Did you know it was one of the first beauty brands to not test on animals? 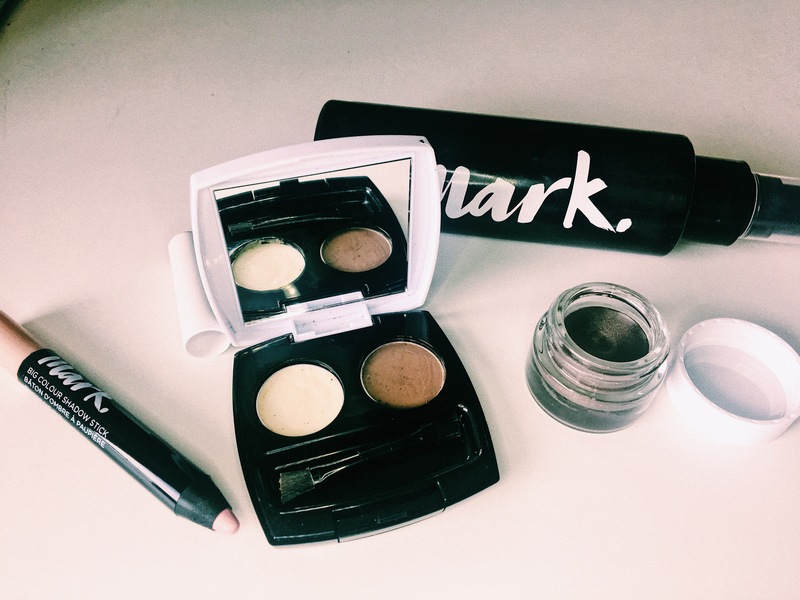 They currently have a new make up brand called Mark, designed for make up lovers to make their “mark”. In America, the brands ambassador is Lucy Hale from Pretty Little Liars. I get a few bits from Avon occasionally as a gift as my boyfriends aunty is an Avon representative (yes, they do still exist). However, I have never sat down and made an order myself. There is a lot more available on the site when you find your local representative. If you go to the top of the website, you can click “find your representative”. You can add your postcode and see the nearest representative to you. When you can find one near you, click the option “shop with me” and it allows you to continue looking online. I picked up the Skin So Soft dry oil as I get bad insect bites and it works well as a repellent. I then went for the Extralasting Inks cream eye shadow in taupe, the Perfect Brow Kit, a Big Colour Eye Pencil in Flipping Out Pink and the Magix Prep & Set Spray. The Perfect Brow Kit has an eyebrow powder and clear wax. I have used it over the last couple of days and really enjoyed how natural it looks as well as sculpting my brow. I have been using the Prep & Set spray before and after doing my make up and it has kept my make up intact. The colours for the eye pencil and cream eyeshadow are great but I am yet to try them out properly. There is always stuff on offer on the Avon site. You might have thought all of those things added up but it only came to £19.99! Yes! You’ll be able to get your order sent directly to your house or wait for your representative to deliver it to you. New York has been top of my bucket list for a long time. I wanted to see places where you felt like you had walked straight into a movie. I wanted to try all of the foods. I wanted to explore and get a real feel of the city. I finally went to New York this May and it really did deliver. New York is so busy! If you aren’t used to that then it can be a little overwhelming. Hell, I live in London and I found it a little overwhelming! The constant people and crowds can make the place feel like a whirlwind but there are little areas of calm if you look in the right places. Despite the fact that I loved the sights, the food and a lot in-between. I have some issues with New York. Everyone gives New York this idea of glamour but it ‘s all like that! You also get told to do so many things from so many different people it can be hard to figure out what you actually want to do. It’s like you’ve done it wrong when people asked why you didn’t end up somewhere! Once we walked nearer to our Air Bnb, I felt a lot more comfortable. 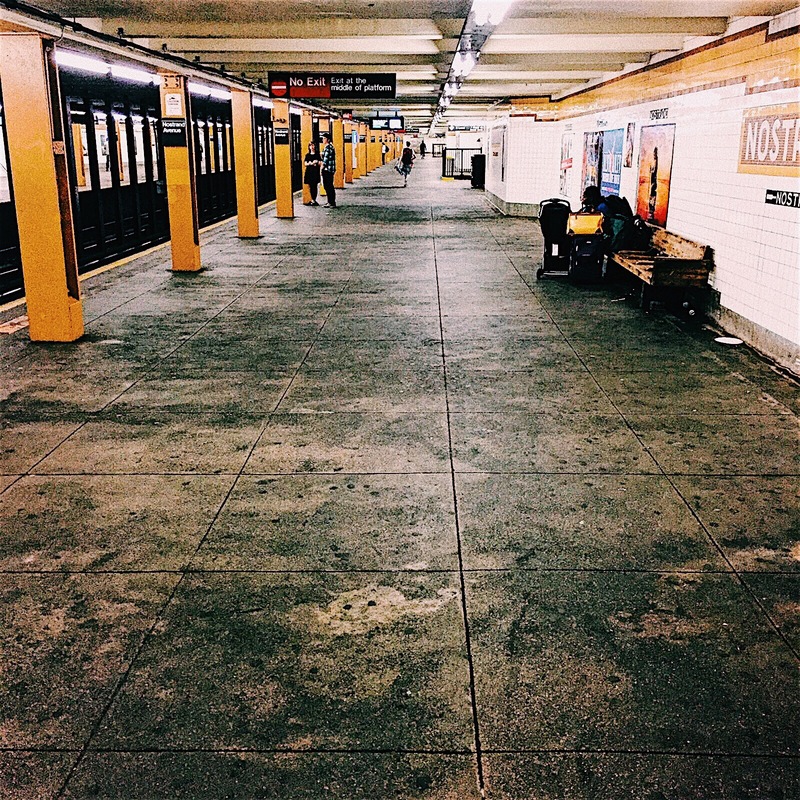 I know that there are dodgy and safe places in most cities but New York was one of the few places I have been worried when wandering around certain parts. You can tell it was a case of gentrification as Williamsburg was exactly how I expected it to be and I loved it. We stayed in Bed Stuy which had good bars and restuarants but it was a little more sparse. I don’t want to knock the holiday I had. On the contrary, I loved my time in New York. However, I found myself explaining my holiday with a few “buts” and I felt guilty. It got me thinking, why should I be feeling guilty? You don’t have to love every single part of a city. It is ok to have down sides to a place. I think people sometimes look at holidays with rose tinted glasses as you aren’t going to love everything you see and do! I refuse to feel like the odd one out as everyone I speak to about New York agrees with some of the downsides once you get chatting about what you got up to. 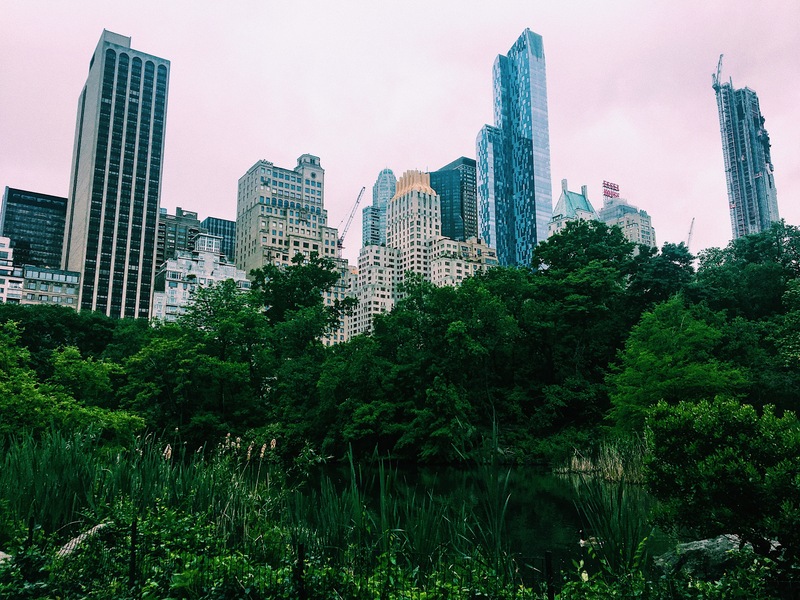 New York has great things I loved and I will be going back. I also know what things I am definitely going to be doing again and other things I wouldn’t. Would you say the same about London? Probably. It is all about picking the best parts for you, not what everyone else tells you to go to. Gone are the days where you put your make up on with your hands (I leave that for quick touch ups in public bathrooms). Now there are lots of things to apply foundation, concealer and contour. I used to have a brush but when rushing in the morning I found I had brush marks, especially around my nose. After a few recommendations I went on to a Real Techniques sponge for my base and a range of Morphe brushes for my cheeks, brows and eyes. However, I see oval brushes everywhere with a pretty high price tag for something I am not too sure about. I went for a wander around Primark and browsed through the beauty section. Surprisingly there are lots of great products. The one thing my eyes fell on were their oval brushes. I picked a small one up for £2.50 to see what all the hype was about. I put a little of my foundation on my hand to massage into the brush. To be honest, I felt like it all disappeared. I used it across my cheeks and saw not much coverage. I was worried I would use too much product so I continued applying my foundation with my Real Techniques Miracle Sponge. Once it got to applying my concealer, I decided to try the oval brush again. The feel of the brush is soft and not bristly. Despite not using it for the application, it was good for blending across your eyes ad nose. Was it worth the £2.50? Probably. Would I buy more oval brushes? Perhaps, but for now I am sticking to my Morphe brushes and my Miracle Sponge. 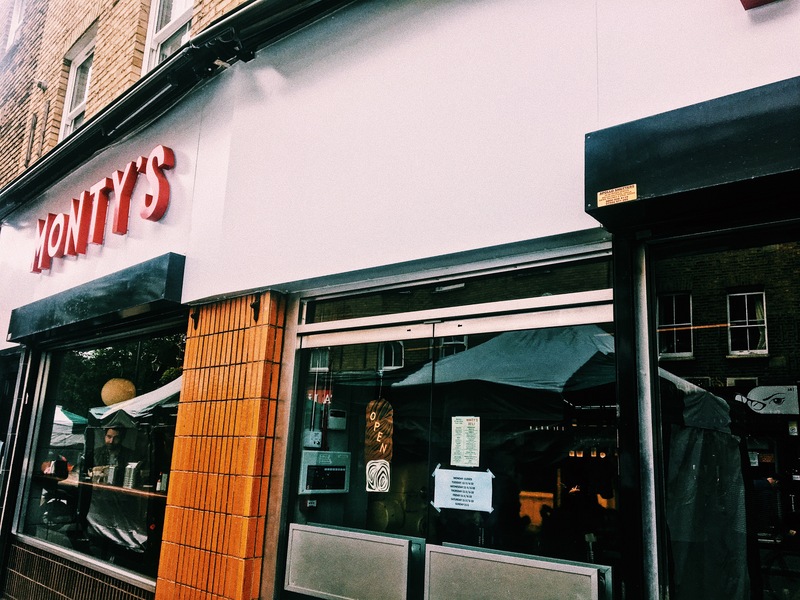 Monty’s Deli has been talked about for years when it was at it’s original spot near Maltby Street Market. 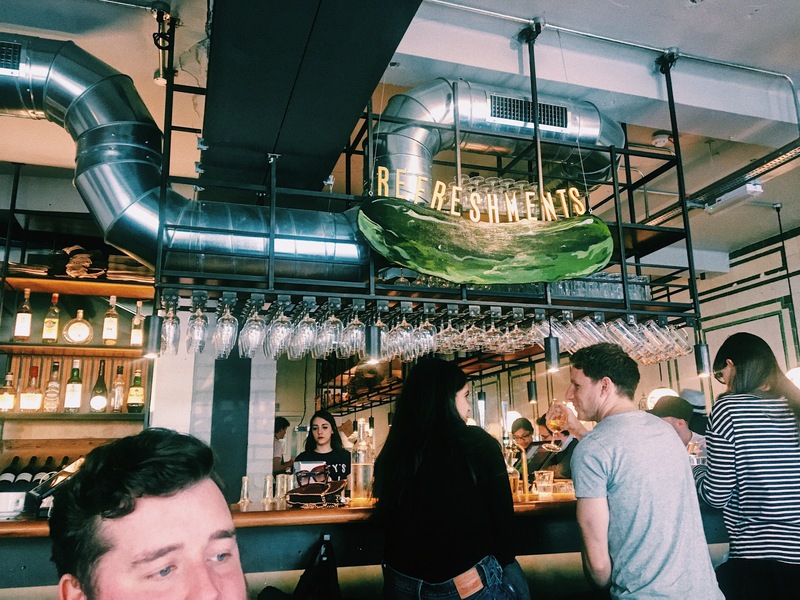 I never had a chance to try it so we decided to try out their brand new home on Hoxton Street. First things first, the decor is AMAZING. I love retro furniture and Monty’s did not disappoint. There was dar wooden chairs, tables and a big old fashioned bar in the middle. The whole place had a feel of what a jewish deli in the 60’s might have been like. The lunch menu was simple, there were a few brunch items but I went for the main event – the sandwich. 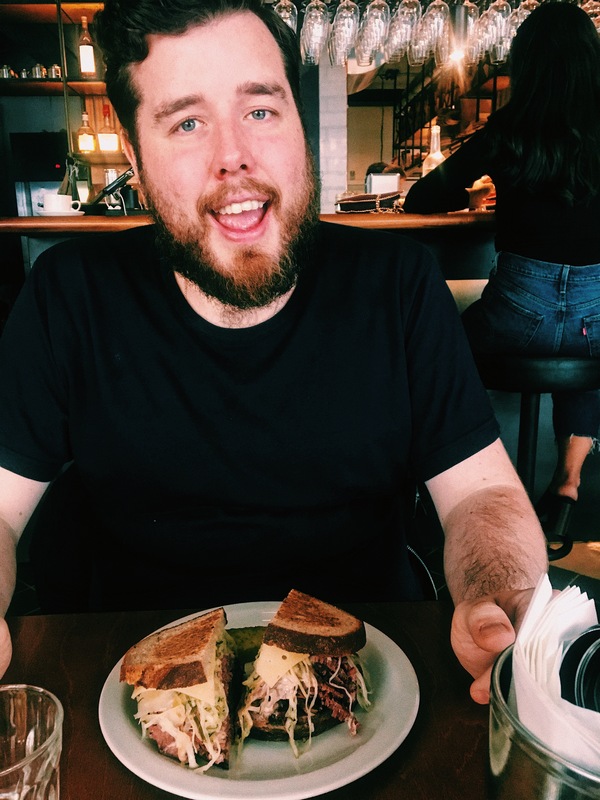 I had the Mensch with salt beef on rye bread and my boyfriend Andrew had the Reuben Special with salt beef, pastrami with cheese and sauerkraut. We shared a portion of fries too. The salt beef was so tender and melted in my mouth! The fries were cut thin with some skin still left on which made them crisp and tasty. There was a takeaway section on the side of the restaurant which meant you could get a sandwich or bagel filled with delicious beef or salmon to take away. 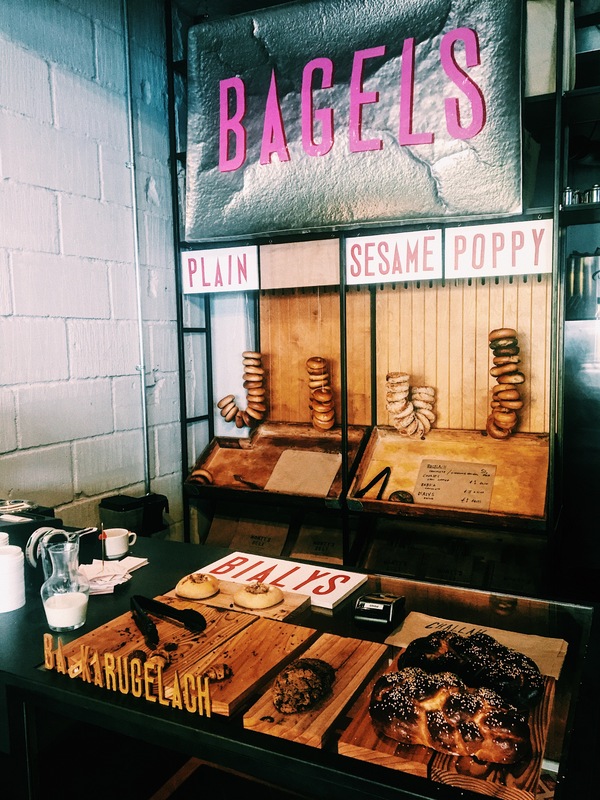 They also had plain bagels to buy in the bakery along with other things. One of my favourite sweet treats is Babka, the twisted dough with cinnammon or chocolate. The Good Egg in Stoke Newington does a really good babka, as does Bernstein’s on Chatsworth Road. However, Monty’s Deli does the best babka I have tried in London. If that isn’t reason to go alone, I don’t know what is! I have had so many cleansers and creams to take my make up off in the past. Miscellar water or gel from Garnier was what I used the most as well as the dreaded make up wipe. I never found anything that managed to take full coverage make up off fully. I wanted something that could become a great addition to my skincare routine. I use Pixi Glow Tonic on days my face needs brightening but i hadn’t looked at the other skincare until the Pixi Pretties collection came out. 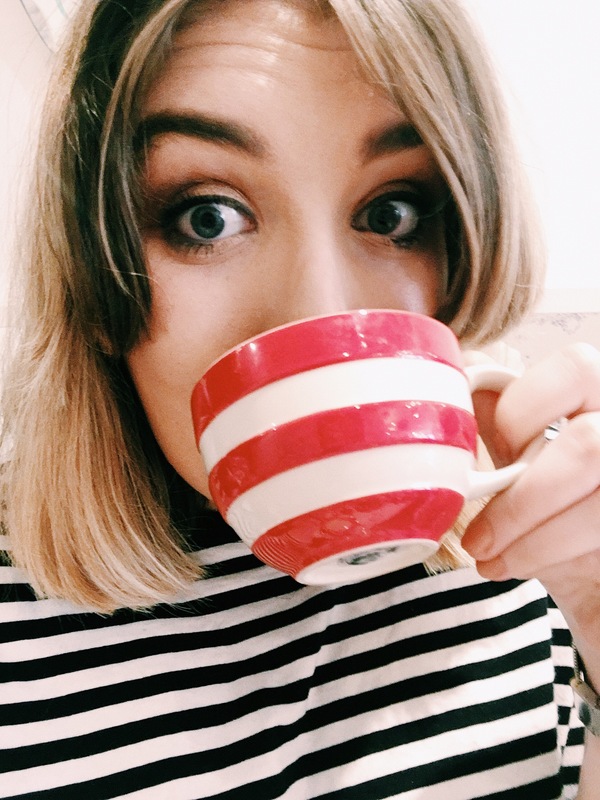 I am a follower of Caroline Hirons blog and Instagram and was so intrigued to try the Double Cleanse. 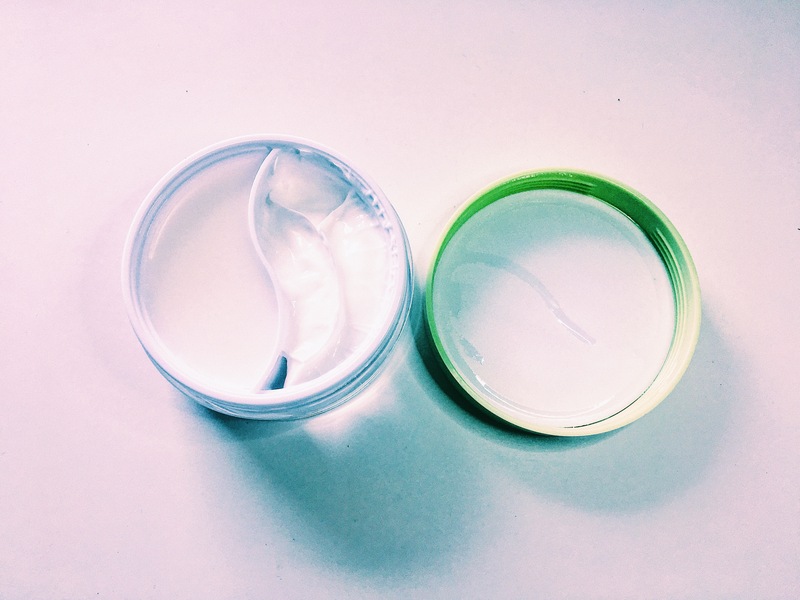 It comes in a huge circular pot that is sectioned into two halves – cleansing balm on the one side and cream on the other. I use a small amount of the balm and work it into my skin slightly with my hands. I then get the Real Techniques Miracle Cleansing Sponge, dampen it and rub the balm into my skin. The difference is incredible. It feels like it melts my make up off. I then do the same when adding a small amount of cream. The cream takes any of the excess make up left on my face. I am honestly so impressed with the Double Cleanse. I recently had an allergic reaction to a new setting spray so I wanted to take make up off as soon as I got home from work. It was a nice way to Cleanse and I am still taking off my make up as soon as I get home as it’s made my skin feel vibrant, clean and soft. On a side note, I highly recommend using the Real Techniques Miracle Cleansing Sponge. It’s great to use when cleansing and it’s really easy to clean and squeeze all of the make up out of it after each time you use it. I’d really recommend the Double Cleanse as it’s made it a joy to do the boring task of taking my make up off. One of my favourite pit stops in Edinburgh was Mary’s Milk Bar. After looking it up online, I was excited to try some ice cream. The exterior looked quaint with it’s stone brick work and its pastel retro sign. Once inside, it was a dream! Just like a parlour in the 1950s, there was lots of little quirks. The lights were ice cream cones, the colours were all pastel and ice cream colours. The furniture was kitsch and kooky. The flavours were a little different to the usual that you would expect. I went for rose and dark chocolate. The taste was intense and delicious. I loved the feel and the atmosphere of the place. You also had a pretty special view of Edinburgh Castle. There were bits to buy too. We picked up a carefully packaged bar of caramel chocolate. 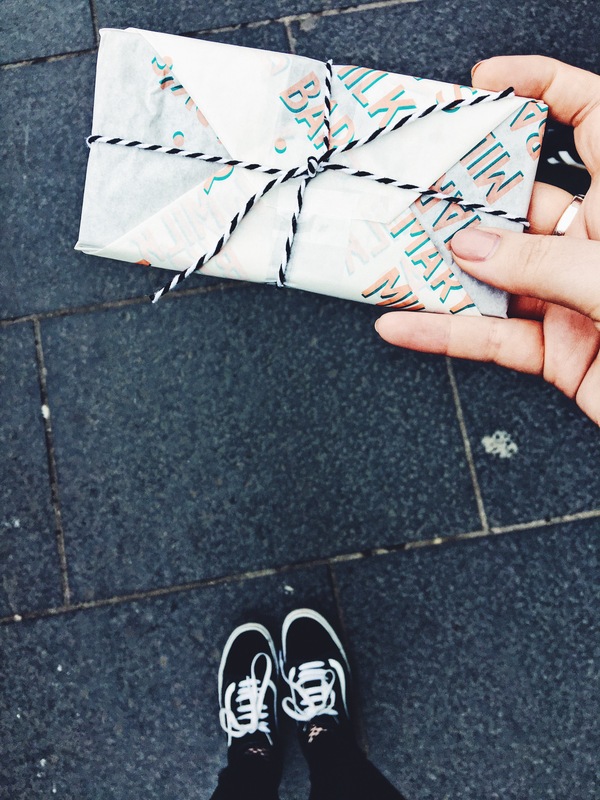 You could also get tote bags, jars of salted caramel and bags of chocolate shards. 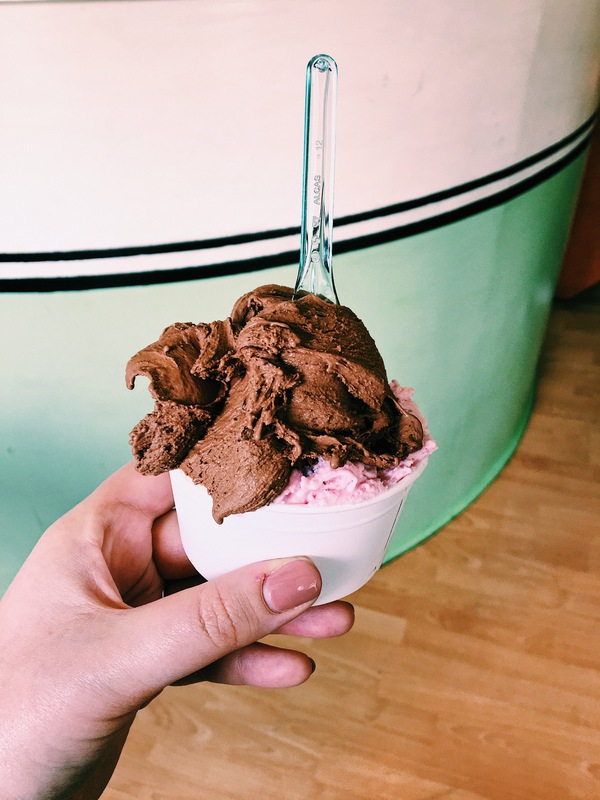 Whatever the weather, if you are in Edinburgh you should definitely make a trip to Mary’s Milk Bar. I will definitely be back again!